Non-aqueous lithium–oxygen (Li–O2) batteries could store energy at densities rivaling gasoline. Commercializing this emerging technology, however, will require breakthroughs that will allow the batteries to be recharged efficiently. Hye Ryung Byon and Eda Yilmaz at the RIKEN Byon Initiative Research Unit have taken a major stride toward this goal by significantly enhancing the recharge efficiency of Li–O2 batteries through judicious application of catalytic ruthenium oxide (RuO2) nanoparticles. Li–O2 batteries eliminate the heavy metal oxide cathodes used in conventional lithium-ion batteries to let lithium react directly with atmospheric oxygen on cathodes made from light, porous materials such as carbon nanotubes. When the battery discharges, lithium ions and oxygen gas react to form lithium peroxide (Li2O2) crystals on the cathode. To recharge the battery, the insulating Li2O2 crystals must be decomposed—a reaction that requires significant recharge potentials, which can shorten battery life. 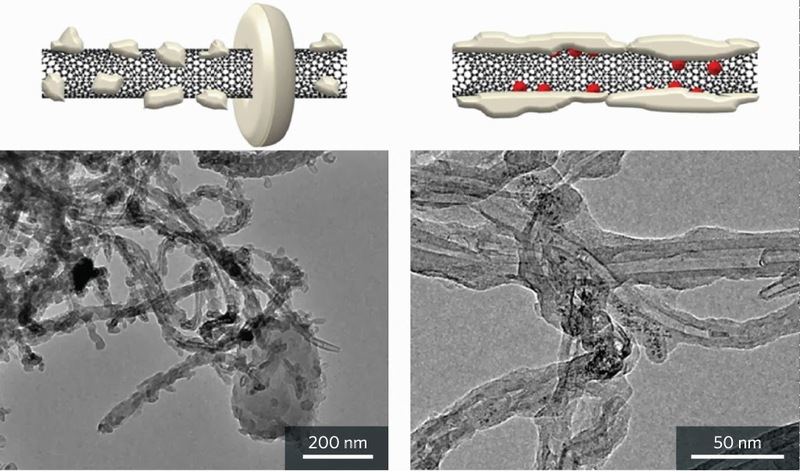 Byon and Yilmaz tried to improve the battery recharge efficiency by adding RuO2 nanoparticles to the carbon nanotube cathodes. "RuO2 has an optimal surface energy for oxygen adsorption and is a good catalyst for oxidation reactions," explains Yilmaz. However, because most ruthenium-based catalyses are performed in aqueous solutions, the team had to tread carefully to understand what would happen when RuO2 was surrounded by solid Li2O2. Experiments revealed that the new RuO2/carbon nanotube composite considerably lowered the battery recharge potential compared to cathodes made from nanotubes alone. To understand why, the researchers collaborated with the Synchrotron Radiation Center at Ritsumeikan University in Kyoto to characterize the discharge products using a number of techniques, including x-ray absorption spectroscopy and electron microscopy. These tests revealed that the Li2O2 deposits on the RuO2-loaded nanotubes had an amorphous morphology quite unlike that seen in any other Li–O2 battery system. The electron microscopy images showed that Li2O2 particles that formed on the bare nanotube cathodes had large, halo-shaped crystals. On the RuO2/carbon nanotube cathodes, however, a formless layer of Li2O2 coated the entire nanotube (Fig. 1). The team notes that this Li2O2 layer has a large contact area with the conducting carbon nanotube cathode. Consequently, Li2O2 decomposition can be achieved with less energy, resulting in improved battery efficiency. "This is one of the first studies showing how catalysts affect non-aqueous Li–O2 batteries; until now there has been little focus on the impact of Li2O2 structure on battery performance," says Byon. "This research might act as a guideline for future alternative approaches."